Paul Fairie is a political scientist at the University of Calgary, where he studies voter behaviour. Follow him on Twitter here. As Canadians' thoughts turn to the military this Remembrance Day week, most will express support for the armed forces, according to public opinion data. Digging deeper into variations in support tells a more nuanced story about the Canadian public's feelings about the military, with overall support not always translating into support for specific military interventions and confidence in the armed forces influenced by which party is in government. Canadians generally report high levels of confidence in the military as an institution. In the 2011 Canadian Election Study, a detailed public opinion survey performed by academics after every federal election, 85 per cent of Canadians expressed either a ‘great deal’ or ‘quite a lot’ of confidence in the armed forces. There is some regional variation in this confidence, with Quebec expressing somewhat lower confidence than the rest of the country. Put in a historical context, this is less surprising, as Quebec has often been more hesitant than the rest of the country about participating in military activity. For example, in 1942, all provinces supported a referendum on conscription to military service except for Quebec. It can also be partly explained by Quebec’s lower levels of support for the Conservatives, an effect we can consider in a little bit. Nonetheless, the variation is not very large, and Canada as a whole expresses high levels of confidence in our armed forces. But support for specific missions seems to be related to whether or not the government of the day endorses the mission. According to polling by Ipsos, the mission in Afghanistan was supported by 72 per cent of Canadians in 2001, while the NATO mission in Libya had 70 per cent of support in 2011. Both of these endeavours were supported by the party holding power. Conversely, in missions which did not enjoy government support, support from the public was lower. In 2012, just 41 per cent of respondents approved of Canadian involvement in a strike against Iran. Similarly, in 2002, 44 per cent of Canadians wanted Canada to intervene in Iraq. The causal arrow here is likely pointed in both directions: governments will be hesitant to engage Canadian troops in a mission supported by only a minority of voters and Canadians are more likely to literally ‘rally around the troops’ to support missions endorsed by the government. There is a belief that is sometimes voiced that support for the military is stronger in some parties than others. To see if these claims are actually true, we can construct a simple measure using data from the Canadian Election Studies. In the most recent versions of these surveys, Canadians have been asked to rate their confidence in the armed forces on a scale anywhere from having ‘a great deal’ of confidence to ‘none at all’. We can then compare the voting habits of Canadians expressing higher levels of confidence in the armed forces to those expressing lower levels of confidence. A simple score can be created for each party by subtracting the levels of support for a given party with lower levels of confidence in the armed forces from the support for that party among voters with higher levels of confidence. For example, if 40 per cent of Canadians who have higher levels of confidence in the armed forces voted for the Liberals, while 30 per cent of those with lower levels of confidence did the same, we could score the Liberals at +10. 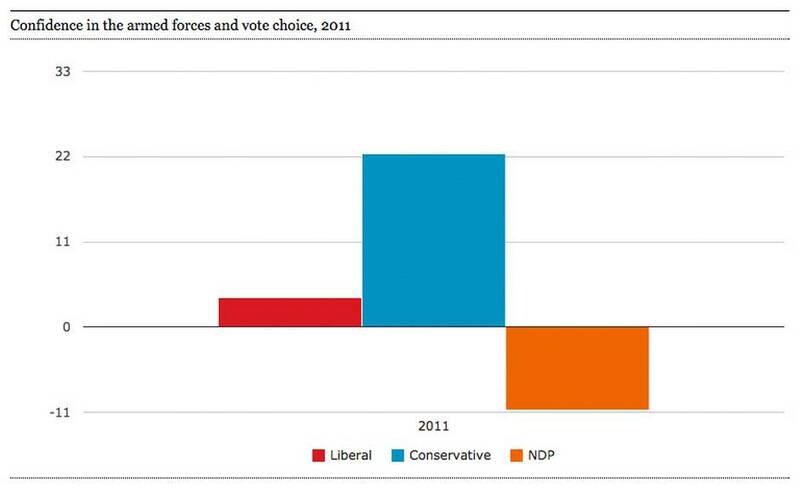 When we look at these scores from 2011 (See the above chart), they suggest that Canadians who are more confident in the military disproportionately support the Conservatives. This might play well into the narrative that a right-wing ideology is somehow more pro-military. However, it is clear when we look at more historical numbers for 1993 to 2011 that confidence in the military is less structured by ideology than partisanship. If ideology was the key factor, then voters with high levels of confidence in the armed forces would more consistently support the Conservatives. 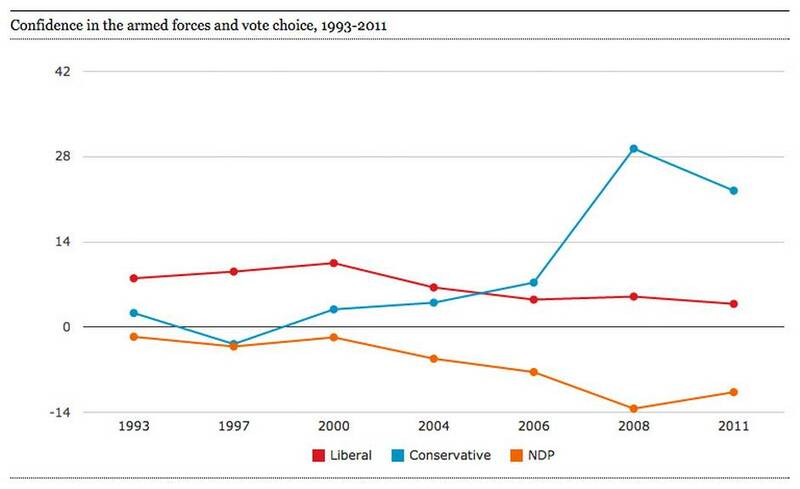 However, this is not the case: when Liberal governments are in power, Canadians with confidence in the armed forces are disproportionately Liberal while when Conservative governments are in power, these same Canadians are disproportionately Conservative. In other words, Liberal voters have more confidence in the military when Liberal governments are in power, and Conservative voters have more confidence in the military when Conservatives have power. This suggests that the differences in opinion over military affairs are less about ideology than they are about which party holds power at the time. Two explanations are equally plausible, and difficult to distinguish between just by looking at the data. One is that voters with higher levels of confidence in the military once voted Liberal but now vote Conservative; the other is that voters feel more confident when the party they support (and presumably the party they agree with on military issues) is running the armed forces. All of this indicates that the high levels of support for the armed forces should not be seen as just a patriotic exercise, but instead as one that is influenced by politics, too.